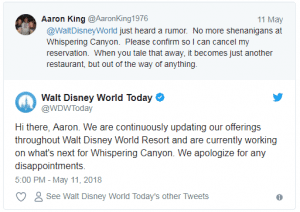 It appears from all of the chatter on various social media outlets that there are major changes coming to the dining experience at Whispering Canyon Cafe. 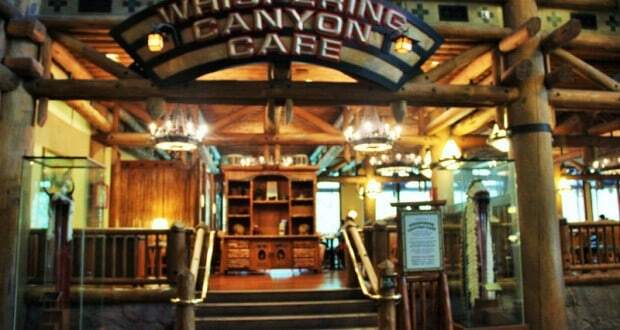 Whispering Canyon Cafe is a table service restaurant located at Disney’s Wilderness Lodge within Walt Disney World. The restaurant is known for a variety of antics, like asking for ketchup and getting bombarded with tons of bottles of ketchup, being given over sized or under sized glasses to drink from or making the longest straws possible to drink from. The level of the antics have varied over the year, but they have always been a staple for the location. It appears that the antics will be discontinued at the location, permanently after recent online developments. Given this change in the overall experience of the restaurant, we don’t know if there will also be a change in the menu or any other impacts. What do you all think of such a major change coming to this iconic restaurant? Will you miss of the crazy antics and silliness that took place at Whispering Canyon Cafe?